“Universal” Is Not An American Value. Never Has Been. I had a lot of trepidation about the ACA when it was proposed, mostly because it’s a contraption with many moving parts, any one of which, if removed will make the whole thing weak, if not useless. But I supported it because the Medicaid expansions was the biggest expansion of a government program for the poor in decades and there was no walking away from that. Still, it was one of the weakest links, always subject to funding problems and the lack of a dedicated voting constituency that could keep it strong. And with the Supreme Court decision to allow the states to opt out, it’s a tragic missed opportunity for millions of people. [R]ight now, we have passed a law meant to expand coverage to all Americans, and yet it does not reach the poorest of our fellow citizens in nearly half the states in the country. That, on its face, is a major policy failure. No one really wanted to say this during the law’s drafting, but its underlying goal was to get coverage to people in red states where there was no local political will to address the problem. It’s generally preferable to let states address their own needs, but in this realm, only Massachusetts and a few others had even attempted to bring about near-universal coverage. The only way people in Birmingham or Brownsville were going to get covered was if the federal government saw to it that they did. I think the health reforms could have been sold as universal health care, but that wouldn’t have been true. There were always going to be people who fell through the cracks and if you didn’t go through several bureaucratic hoops anyone could easily find themselves uncovered when they need the care. It was never intended to cover everyone — indeed, they went out of their way to exclude undocumented immigrants, even their kids. But the Medicaid expansion was supposed to make it possible for the working poor who could never afford to buy insurance even with the subsidies to have health care. And we couldn’t even get that across the whole country. The problem is the idea of “universal”. That is simply not an established American value. We are generally quite content to live in a country with vast disparities in rights, health, wealth and security out of some outdated fealty to “states’ rights.” And that lies at the root of so many of our problems. 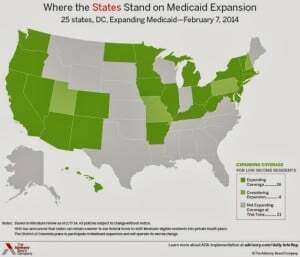 Take a look at the map of the states that refused the Medicaid expansion. Look familiar?